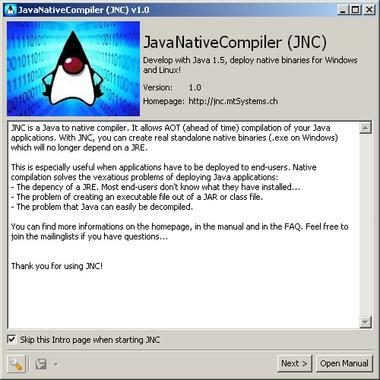 JNC is a Java to native compiler. It allows AOT (ahead of time) compilation of your Java applications. With JNC, you can create real standalone native binaries (.exe on Windows) which will no longer depend on a JRE. This is especially useful when applications have to be deployed to end-users. All vexatious problems of deploying Java applications can be solved by compiling them to native. They will be: - Easy to deploy: No JRE dependency. Most end-users don't know what they have installed. No more problems on how to create an executable file out of a JAR or class file. - Hard to decompile: Java can easily be decompiled. Native compilation will protect your source code. - Run fast from the start: No more overhead for loading a JRE. System requirements: The download is the GUI frontend for Windows. Needed compilers or Linux versions are on the website.